hen Herbert Hoover took his oath of office as President of the United States on March 4, 1929, the die was already cast. The stock market was going to crash that fall. On Tuesday, October 29, 1929 the short sellers would begin shorting the market. Calls would go out from JP Morgan & Company. The messages contained only one word. Sell. As the roller coaster ride began that day, American financier Bernard Baruch brought an illustrious visitor with him to the New York Stock Exchange. Baruch's guest, England's former Chancellor of the Exchequer, Winston Churchill was brought to the center of American commerce at 11 Wall Street for a reason. The world was about to change and the princes of industry and the barons of banking and business wanted England's recent top bankerthe equivalent to the American Secretary of the Treasuryto witness the power of the lords of banking in the United States as they reshaped America. Churchill had just resigned his position in Prime Minister Stanley Baldwin's government after saving the pound sterling from devaluation by temporarily restoring the British monetary system to the gold standard. Something the Fed bankers in the United States opposed since they needed an elastic fiat monetary system to grow their own wealth. Most conspiracy chroniclers were convinced that Churchill, who did not hold public office again for a decade, was singled out by the money barons to witness the power possessed by the international bankers who could, at will, collapse the monetary systems of any, or all, of the nation states of the world, bring about a major recession, or inflate or deflate any nation's currencyor worse, pit one nation against another in war. At the moment, they were preparing to reshape the world into a socialist model that would not be to the liking of either Churchill or Great Britain. And, it appears they wanted a witness. Churchill was to be that witness. While there are no written records to suggest that hypothesis is true, there is likewise none to dispute it. Baruch, like the princes of industry and barons of banking and business, began shifting his holdings from paper assets (stocks and bonds) into gold notes, coins and bullion in the fall of 1928 to await the storm. The stock the working class investors was buying was the paper wealth the money barons were liquidating. In April, 1950, in an American Opinion magazine article, Gary Allen reported that Baruch told Churchill that he "...began liquidating [his] stock holdings..." the previous winter and put his assets "...into a cash reserve." (Keep in mind that in 1929, the United States was on the gold standard, and our paper money was redeemable on demand for gold.) Baruch told Churchill that Joseph P. Kennedy , a man Churchill apparently knew well, (and who would become the first Director of the Securities & Exchange Commission) had already done the same. In 1915 Congressman Francis Oscar Calloway [D-TX], a member of the Committee on Expenditures, accused the American banking community of attempting to control the news media by buying controlling interest in America's most influential newspapers. In March, 1915, Calloway placed the following comment in the Congressional Record: "JP Morgan interests...got together with twelve men high up in the newspaper world and employed them to select the most influential newspapers in the United States...to control generally the policy of the daily press of the United States. These men...select[ed] 179 newspapers, and then began by an elimination process to retain only those necessary for the purpose of controlling [the news]. They found it was necessary to purchase control of 25 of the greatest newspapers." When Calloway ran for reelection to the 12th Congressional District of Texas in 1916, the media solidly lined up against him and he failed to win a 4th term. James Clifton Wilson defeated him in the Democratic primary and went on to win Calloway's seat in November. Calloway retired from politics and returned to his farm in Comanche, Texas where he contented himself being a gentleman farmer until his death on Jan. 31, 1947 at the age of 75. With the media reporting only the news the money barons believed was fit to print, the collapse of the Stock Market was blamed on its victimsthe amateur, working class investors whom the media claimed simply panicked when they saw their lifesavings being erased in a ticker-tape charade that began on Black Thursday. October 24, 1929 and climaxed on October 29 when the market collapsed. If they had simply held their stock, the media pundits surmised, Black Tuesday would never have happened. The Market would have correctedas it does from time to timebut the Market would not have collapsed. Not true. What happened between Thursday, Oct. 24, 1929 through Tuesday, Oct. 29, 1929 was a carefully staged dichotomy. Two theoretically unrelated factors came into play simultaneously, guaranteeing that what transpired necessarily had to happen. 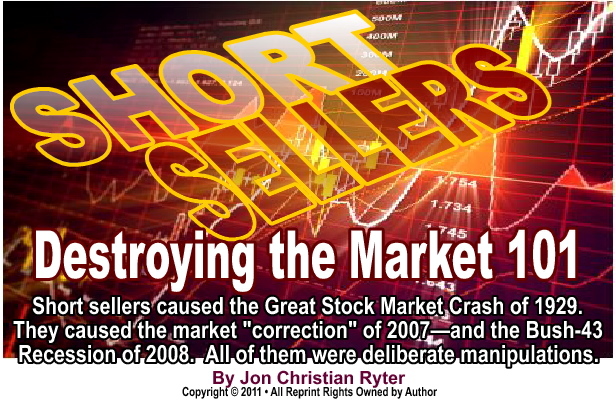 First, triggered by short sellers, the bottom fell out of the market as a major sell-off began. The sellout began with the "remnant shares" left in the accounts of some of the conspirators who had previously sold-off the bulk of their stock portfolios, which were used by the short sellers to start the run. As the short sellers dumped the "loaned" stock, telephone calls were strategically placed to key brokers across the country telling them to dump their portfolios. As stock prices plummeted, the same brokers began calling in "24-hour demand notes," forcing investors who had purchased their stock on margin, to pay the margin call or liquidate their holdings. Panic now set in on Main Street America. By the time the market closed on Friday, a slight recovery from the beating taken by small investors offered a thin ray of hope that the sell-off was over. However, when the Market opened on Monday morning, the short sellers were back, the slide began anew with even more vigor than it had on Friday. Small investors who had enough savings to ward off the loss of their stock on Friday discovered, on Monday or Tuesday, that they no longer had the personal liquidity to meet the new margin calls. This time, when they lost their stock, many of them, who had pledges their homes as collateral, lost everything. Author John Kenneth Galbraith who, on page 111 of The Great Crash of 1929, declared that nobody "...was responsible for the great Wall Street crash...Nothing could have been ingeniously designed to maximize suffering, and also to insure that as few as possible escaped the common misfortune...The man with the smart money who was safely out of the market when the first crash came, naturally went back to pick up bargains." Galbraith was correct about one thing. None of the buyers who picked up the bargains suffered any appreciable losses when the Crash first registered on the economic Richter scale on Black Thursday. But, where Galbraith held that nobody was responsible for the Crash, Congressman Louis T. McFadden [R-PA], head of the House Banking Committee did. On May 23, 1933, McFadden submitted House Res, 158, Articles of Impeachment against FDR's Treasury Secretary, Henry Morganthau; two assistant Treasury Secretaries, the Board of Governors for the Federal Reserve, and the officers and directors of the 12 regional Fed banks. Just as the bankers went after Oscar Calloway in 1916, they went after McFadden in 1934. Political analysts believe McFadden's swan song was most likely his fateful June 10, 1932, 25-minute anti-Fed speech on the floor of Congress more than his abortive attempt to impeach them. Whichever was the catalyst, in 1934 the bankers heavily supported, and Pennsylvania newspapers heavily endorsed, Democrat Charles E. Deitrich for McFadden's House seat. Deitrich won by a margin of 561 votes. There was no recount. But, without the big money support of the bankers who wanted to get rid of McFadden, Deitrich was unable to win reelection. McFadden tried to launch a comeback in 1936. The bankers backed his opponent, Albert Rutherford. Rutherford won the nomination from McFadden, and took the House seat away from Deitrich. McFadden died on Oct., 3, 1936. He complained of feeling ill while eating during a dinner party. He left the party early and went home. He was found dead the following morning. The coroner, without doing an autopsy, ruled that McFadden suffered a sudden-death heart attack. It was the speed and lack of any real investigation that led to speculation that McFadden had been poisonedparticularly since he complained of feeling sick while eating. No analysis was done of the food he ate. No analysis was done on the food content in his stomach. An arbitrarily judgment was made by the coroner even though McFadden survived two previous assassination attempts only because the assassin or assassins' aim was bad. Those previous attempts, and allegations by McFadden adherents that a cabal of bankers were determined to kill him, should have triggered an autopsy even if there was nothing suspicious about his death. It didn't. The most powerful cabal of men in the worldfar more powerful than any world leader, democratic or despoticare the international bankers who control the interlocked central banks of the world. Real power is not the power to rule, but the power to appoint someone to rule. In 1957 US Senator George W. Malone [R-NV] made a speech on the floor of the Senate, speaking about the corruptness of the Federal Reserve. In his speech he made this indictment: "I believe that if the people of this nation fully understood what Congress did to them over the past 49 years..." [by creating the Federal Reserve banking system], "...they would move on Washington. They would not wait for an election. [What the Fed has done]...adds up to a preconceived plan to destroy the economic and social independence of the United States." When Malone ran for reelection in 1958, the bankers backed a Democrat, Howard Cannon, who won his seat. Malone ran for a House seat in 1960, but was defeated. Henry Ford, founder of the Ford Motor Company, who fought the JP Morgan cartel most of his adult concurred. Speaking about the Fed, Ford said: "It is well enough that [the] people of [this] nation do not understand our banking and monetary system, for if they did, I believe there would be a revolution before tomorrow morning." Like most of the unconstitutional act the United States Congress has foisted on the American people by simply ignoring the Constitution, none were as wretched as the creation of the Federal Reserve systema privately owned central banking system which the Founding Fathers went to great lengths to prevent. The Founding Fathers specifically delegated the unassignable authority to create, and manage, the monetary system of the United States to Congress. Sadly, since specie (lawful money) was gold, silver and copper coins and not scrip (paper money) we use today, the phraseology in the Article I, Section 8, paragraph 5 contained the legal loophole the politicians in bed with the princes of industry and barons of banking and business needed in order to redraft that constitutional prerogative, and surrender their monetary rights to the bankers who were making them very wealthy men. Article I, Section 8, paragraph 5 gave Congress the exclusive power "...to coin money, regulate the value thereof, and foreign coins, and fix the standard of weights and measures." Since the printing of fiat scrip was not a delegated authority, the Federal Reserve Act transfers that "right" to the privately owned central bank they were creating. Before continuing, I need to reiterate something once again. If you follow this website you know I am opposed to allowing the princes of industry and the barons of banking and business to bribe politicians. I have advocated for years that campaign contributions be outlawed for what they arebribery. If the American people expect to take their country back before we flush what freedom we have left down the toilet, we absolutely must criminalize what are now legal bribes that the politicians who receive them and their cohorts in the media call "campaign contributions." As noted above, in 1929, eight months after Republican Herbert Hoover took office, short sellers employed by the nation's largest investment banks, very deliberately triggered the Market Crash. Why? The Fed bankers wanted to remove the United States monetary system from the gold standard. At that moment, the "gold bloc" nations were the United States, England, Canada, Australia and the other nations within the British Empire whose economies were controlled by London. Also part of the "gold bloc" were France, Belgium, Argentina and Brazil. During the early years of Roosevelt's depression (I am tired of having revisionists blame Hoover for Roosevelt's Depressionjust as I am tired of Barack Obama blaming George W. Bush for his financial crisis). During the Great Depression, socialist economist John Maynard Keynes argued that wrong economic decisions by the private sector have bad macroeconomic outcomes. Those decisions, he claimed, sometimes result in the need for action by governments and their central banks to stabilize the economic output in order to correct the misjudgments by private sector businessmen. Keynesian economics is pure baloney. Most economists are completely in the dark what causes economic upturns and downturns, and what causes inflation. It's quite simple. Manipulation by bankers. Or better yet, very deliberate and malevolent manipulation by bankers. The reason? Whatever need the central bankers have at the moment. In 2007 Indonesia's Bank Century failed, losing 6.7 trillion rupiah ($720 million). That bank failure came on the heels of the insolvency of Indonesia's central bank, Bank Indonesia, a decade earlier which brought instability to all of Indonesia's banks. By 2005 several US banks were in trouble over the subprime mortgages debacle. While Barack Obama likes to blame the subprime collapse on President George W. Bush since it happened on his watch, the subprime mortgage concept was Obama's idea as a community organizer in Chicago in the early 1990s, even though it was President Bill Clinton who amended Jimmy Carter's Community Reinvestment Act of 1977 that pushed banks to make home loans in impoverished areas. The Clinton adjustments forced banks to accept credit unworthy loan applicationswith stiff penalties levied on any bank which declined mortgages to poor credit risk buyers. The icing on the subprime cake was Franklin RainesVice President Al Gore's buddy. Raines was the head of Fannie Mae during the Clinton-Gore years and beyond. He agreed to guarantee the worthless loans that Obama's community activism spawned. In the world of the social progressive, there is never a day-of-reckoning. You simply dig a little deeper into the pockets of the middle class to cover your needs. Every problem is solved with a little tax hike. As the subprime hedge funds began showing signs of stress in 2005, Bush-43's Securities & Exchange Commission head William Donaldson, decided it was time to more closely regulate the hedge funds of the major investment banks by restoring the Uptick Rule. After Bush forced him to resign, Donaldson appeared on the Bill Moyer Journal. Moyer asked him why he wanted to regulate the hedge funds and what, he wanted to know, made them so dangerous. Donaldson replied that hedge funds use private pools of capital. "They originally started out as a way of investing by both going long and short stocks, supposedly market neutral, as they say. But through the years, the name "hedge fund" has been applied to any pool of capital that is not registered with the SEC...Latest figure's $1.7 trillion of money in hedge funds todaythat's ten times growth in less than ten years. Through a quirk in the regulatory structure, hedge funds are not regulated like mutual funds are, or like investment advisors are, or like investment managers and brokerage firms are. This is," Donaldson continued, "just crazy that we can have, you know, $1.7 trillion dollars.. On some days, hedge funds account for 50% of the volume on the New York Stock Exchange...We ought to at least understand what's going on...and the risks...But the real issue is everytime a hedge fund buys or sells something..." it impacts the public, it impacts institutions and it impacts the market. What Donaldson did not tell Bill Moyer in that Oct. 12 interview was that what makes hedge fund short sellers so dangerous is that, first, they caused the market collapse in October, 1929 that devastated the US economy for almost a decade, destroyed the life savings of millions of Americans and, in many cases, caused hundreds of thousands of American families to lose not only their homes but every asset they possessed. Or, that in 2007, when the Uptick Rule was repealed by Donaldson's replacement, former Congressman Christopher Cox, short sellers once again began a bear raid on working class investors, devastating the Market and emptying the IRAs and 401Ks of American Baby Boomers who were just filing for Social Security benefits that were supposed to supplement their company 401Ks (which were suddenly worth virtually nothing), and also by downsized workers whose jobs were exported to China, India, Pakistan, Indonesia, Canada, South America and Africa, and whose 401Ks were now just as worthless as the promises of rogue American-branded companies who now preferred the human capital of the third world who possessed nothing and needed everything over the "replacement market" US consumer who has everything and needs nothing until what he has breaks, wears out or is superseded by a super deluxe new version. As the short sellers devastated the working class investors between 2007 and 2009, and destroyed the subprime industry, they weakened some of the nation's most notable subprime financial institutions. Was it accidental? No. If you recall history, one of the first things that happened during the Bank Panic of 1907, money dried up. Not only on Wall Street, but in the commercial banks on Main Street. The Mercantile National Bank which, with Knickerbocker Trust Bank, tried to leverage United Copper Company and corner the copper market. On Wed., Oct. 16, 1907 F.A. Heinze, the president of Mercantile, failed to buy enough shares and take over the company. The stock, which was selling for $62 per share plummeted to $15. Short sellers sold the bottom out of the copper market. Shorting copper sent new tremors through the financial market. Shortly before midnight on Thursday, F.A. Heinze was forced to resign. That night the New York Clearing House declared Mercantile to be "...perfectly solvent and able to meet all of its indebtedness." They said they would stand by the bank in the event of a run. On Friday, Oct. 18 nine banks, including Knickerbocker, formed an emergency pool to come to the aid of Mercantile But because Knickerbocker Trust Bank was tied to the failed United Copper takeover, Knickerbocker depositors, afraid that their bank might fail as well, began to withdraw their money. By Monday, Oct. 21, Knickerbocker withdrawals morphed into a full-fledged run with depositors withdrawing $8 million in less than four hours. Charles Barney, who was the CEO of Knickerbocker, jumped to the aid of Mercantile He was forced to resign from Knickerbocker, but his effort was too little, too late. Knickerbocker closed its doors and suspended operations. Bankers' Trust CEO Benjamin Strong called JP Morgan for advise. Morgan said he had already written off the Knickerbocker Trust Bank as lost. The bank died with his spoken words. That same day, a headline in the New York Times noted that JP Morgan was backing the Trust Company of America to pick up the assets of the failed banks. The following day Teddy Roosevelt Treasury Secretary George Cortelyou traveled to New York to meet with Morgan and several other financiers including Bankers' Trust's Strong and Rockefeller's First National Bank officials Henry Davidson and Thomas Lamont . The bank asset fire sale was officially on. In 1907 there were three types of banks in the United States. National banks, State banks and less regulated "Trusts." (These are the same types of financial organizations we know today as Savings Banks or Savings & Loan Companies which ceased to exist with the Savings and Loan scandal in the early 1990s.) The Bank Panic of 1907 was largely centered on the latter type of financial operation, but its impact reached across the country. The first tremors of problems in paradise appeared when the federal government suspended the Sherman Antitrust Act of 1896 to allow America's behemoth banks to buy the assets of the troubled Trusts. Just as JP Morgan Chase took over Bear Sterns in 2008, Morgan and the Rockefeller Banks took over the assets of failed Trusts. In 2007 and 2008, were we following a parallel history of 1907 and 1908? Yes, we were. Did the 1907 and 1908 front page print newspaper stories parallel news stories of the 2007 and 2008 TV news reports of the Lehman Brothers, Bears Sterns, Merrill Lynch and Washington Mutual collapses? Yes they did. Did parallel bank crises happen accidentally one hundred years apart? Bank crises don't happen by chance, even ten years apart. Bank crises are engineered because bankers, or the governments they control, want or need them to happen. In 1907 the catalyst that created the bank crisis that gave us the Federal Reserve and the income tax was United Copper Company. Think the financial crisis of 1907 was happenstance? In 2007 the catalyst was subprime mortgages and the need to surreptitiously bail out third world banks. Think the financial crisis of 2007 was happenstance? Think again. Who got what in 2008? JPMorgan Chase got Bear Stearns on April Fool's Day, 2008. Bank of America got Countrywide Homes on July 1, 2008. The US Treasury took over Fannie Mae and Freddie Mac on Sept. 7, 2008. Bank of America took over Merrill Lynch on Sept. 14, 2008. And the most shocking transfer, American International Group, which was believed to be too large to fail, was presumed taken over by the US government on Sept. 16, 2008. A day later, Barclays Bank in London took over Lehman Brothers. On Sept. 26, 2008 JPMorgan Chase took over Washington Mutual. Interestingly, on Sept. 26, ownership of Lehman Brothers was transferred to Nomura Holdings for $2. On Oct. 3, 2008 Wachovia was taken over by Wells Fargo; and on Jan. 1, 2009 IndyMac Bank was sold to IMB Holdingan interim bank established by the FDIC. Thirty banks were toppled by the subprime crisis in 2007 and 2008. One hundred and twenty-six banks, which should not have collapsed, toppled from Jan. 1, 2007 to Dec. 31, 2009. The catalyst that triggered the collapse? The subprime mortgage industry collapse which was triggered byyou guessed itshoart sellers. What's wrong with that scenario? The Bush-43 Troubled Asset Relief Program [TARP] was designed to protect against the collapse of any bank, and keep credit flowing, by giving the Resolution Trust Co., the funds to buy foreclosed mortgages from those banks holding the bad debt, by removing the liability from the bank or mortgage company's books. What happened? First, the Federal Reserve, which is a privately-owned bank that listens to no one, made the problem worse by mandating that every bank in the United States which was holding any defaulted mortgages was required to recompute the value of the property based on depreciated appraisals of the foreclosed assets on their books. What does that mean? In addition to holding a worthless unpaid mortgages, the assets themselvesthe homeshad just been devalued by the Fed. What does that mean? It means the liability side of the ledger sheet just grewin some cases, dramatically. On paper, its asset-to-debt ratio just got tossed on its head. To the Fed, that means the bank was now insolvent. One hundred twenty-six of them were assumed by bigger banks. Now, let's ask Bill Moyer's Oct. 12, 2007 question to Bill Richardson again. "What makes short sellers dangerous?" All of the comments above. After an extensive investigation that short selling caused the Stock Market Crash of 1929, the Securities & Exchange Commission instituted the Uptick Rule, more commonly known as Rule 10a-1 and 10a-2 of the Securities Exchange Act of 1934, which took affect in February, 1938. Why did Congress implement Rule 10a-1 and 10a-2? Because their investigation of the practice convinced them that short selling was criminal. The SEC eliminated the short tick rule on July 6, 2007 and let the short sellers devastate the Market to camouflage the bank crisis in the third world, whose debt the working class in the industrialized nations was expected to repatriate. In March, 2009 House Financial Services Committee Chairman Barney Frank [D-MA], pushed to do so by several members of Congress from both sides of the aisle, called Obama SEC Chair Mary Schapiro and told her it was time the Uptick Rule was restored. Legislation to permanently restore the Uptick Rule was introduced on Jan. 9, 2009 by Congressman Gary Ackerman [D-NY], garnering support from discount brokers across the countrybut not banker-owned Reuters News Agency which referred to the short selling as "...a legitimate investment strategy where investors borrow stock they expect to fall in price in the hope of repaying loans for less and profiting from the difference. That type of investing was heavily criticized by corporate America when the markets were dropping precipitously in 2008, and some said the repeal of the rule contributed to market volatility and downward pressure." Senator Johnny Isakson [R-GA] is now advocating that the SEC reinstate the Uptick Rule "...in order to stabilize the markets and protect the American consumer from traders forcing down the price of stock. Market deterioration was impacted by short sellers, shorting financial stocks and accelerating the decline of those values. And finally, the mark-to-market (Rule FAS-114)...caused tremendous problems for our nation's banks...and disproportionately penalized the very people we serve. " Mark-to-market is the Fed rule that forced banks to reappraise the asset value of the homes which were collateral for the loans which financed them. It was this rule that cast 126 solvent community and investment banks as insolvent. Isakson wants Congress to replace FAS-114 with a legislative mechanism of amortizationor "smoothing" to absorb depreciated assets over time. Isakson further wants to create a congressional Financial Crisis Inquiry Commission which will be tasked with overseeing the financial industry, with the authority to investigate the financial industry's near collapses and the losses of tens of trillions of dollarsnot to mention the loss of tens of billions of dollars lost from the retirement 401Ks and IRA's of the American workforce, many of whom expected to retire in 2007 through today but could not because short sellers stole their retirement nest eggs. For what it's worth, here's my uptick. Short sellers deliberately destroyed the retirement incomes of working class "dividend investors" (people who invested for their golden years) beginning with the repeal of the Uptick Rule in 2007. Thousands of working class investors, who expected to retire when their companies "downsized them" as they moved their jobs to the emerging nations, woke up one morning and discovered their retirement nest egg was also gone. It's almost like the princes of industry and the barons of banking and business decided it was their right to take as much back from those whose sweat equity grew their visions into global corporations as they could by taking their jobs, their benefits, and their peace of mind in their old age. Congress needs to legislatively restore the Uptick Rule permanently and remove the right of Securities & Exchange Commission, or the Fed, or the White House by Executive Order, from waiving, rescinding or repealing it at any time, for any reason, in the future. 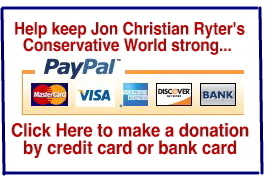 Copyright © 2011 Jon Christian Ryter.